It is one of the most interesting architectural areas in Rome. The whole complex (square and buildings) was built in the sixteenth century according to Michelangelo's designs. Placed on the Capitoline Hill, it suffered during the centuries various remaking until it assumed the actual shape, according to Michelangelo's project .Since the ancient times it was a very important place for the life of the City, being first, a religious centre, and then, the seat of Roman Senate. Today it is the Town Hall. 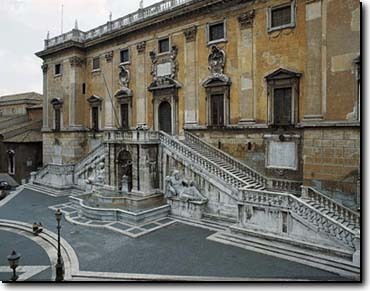 You can reach the Capitol by the great flight of steps built according to Michelangelo's designs. At the top of the stairs there is a balustrade whith the statues of Dioscuri raised during the imperial period. You can admire in the middle of the trapezoidal square Marcus Aurelius's statue, on its left the "Palazzo Nuovo", seat of Capitoline museum, on its right the "Palazzo dei Conservatori" and behind the statue the "Palazzo Senatorio" with its beautiful stairs realized by Michelangelo, and the fountain with the ancient statue of sitting Minerva. The Capitoline Tower, erected in the 16th century, overlooks the "Palazzo Senatorio". It is a sepulchral monument and a masterpiece of sculpture. Erected to immortalize Traiano's exploits, it is 42 meters high and was built in the 2nd century A.D. In ancient times they were considered one of the wonders of the classical world; today they show only one small part of their splendour. The great complex, consisting of 150 premises, was planned by Apollodoro from Damascus for Trajan in the II century A.D.